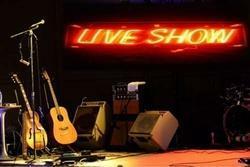 Service Provider of Event Organizer - Live Concerts & Stage Shows, Conference Organizers and Trade Fair Organizer, ETC. Events are often considered as the most effective & direct tool for any communication. Just because of their live presentation, entertainment. Concerts have always amused people from all ages ranging from Sufi to trance. Be it live band performances, folk performances, ghazal evenings, stand-up comedy we have flair in organising one and all. We believe in creating an everlasting experience so grand that our audiences return with a come back guarantee. We give utmost preference to customer satisfaction and so provide customised event planning service as per your interest. We take orders from your doorstep and make your job easier in organising special moments of life. Straight from planning to execution, we follow a strategic, creative, and original approach to give out the best of event organising services in this industry. A live concert is exciting because of all the electricity that is generated in the crowd. We'll help you add to that spark of your concert. Perhaps no other event requires as much creative and technical preparation as a live concert. We have a formidable track record where such live performances and concerts are concerned. From Bon Jovi and Deep Purple to Lata Mangeshkar & Hrithik Roshan…the names speak for themselves.